“A Computer is a device that can be instructed to carry out sequences of arithmetic or logical operations automatically via computer programming“. Computers follow a generalized set of operations termed as programs. The programs enable the computers to perform an extremely wide range of tasks. Computer Terminology presents a glossary of important Computer Terms related to both hardware and software along with the definitions of the terms. 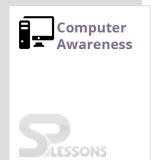 Computer Terminology is widely used i the computer awareness section of various competitive exams. Access The reading or writing of data; as a verb, to gain entry to data. Most commonly used in connection with information access, via a user ID, and qualified by an indication as to the kinds of access that are permitted. Access Control List (ACL) A list of the services available on a server, each with a list of the hosts permitted to use the service. Access time The time interval between the instant that data is requested and the instant that it is received. Account Your subscription to a networked computer system. Account name Same as your login ID or user ID. The word you type at the “Login:” prompt; your electronic name. Address A character or group of characters that identify a register, a location or some other data source or destination. Aggregate A total created from smaller units. For instance, the population of a county is an aggregate of the populations of the cities, rural areas, etc. Aggregate data Data that have been aggregated. Algorithm A set of rules for solving a problem in a given number of steps. Analog A method of storing information, used by most audiotapes, videotapes and laserdiscs. Application Layer Layer seven of the OSI reference model. It serves as a means by which applications access communications services. Application The use to which a data processing system is put within a given discipline, such as a payroll application, an airline reservation application or a network application. Application program A program that is written for or by a user that applies to the users discipline. Application software A group of programs designed to perform tasks that can be tailored to a users specific needs. Argument A value supplied to a procedure, macro, subroutine, or command that is required in order to evaluate that procedure, macro, subroutine, or command. Synonymous with parameter. The form in which text characters are handled in most computer systems and networks. ASCII text has no special characters for formatting such as underlined or bold characters, font changes, etc. Assembler A program that converts symbolically-coded programs into object level, machine code. In an assembler program, unlike a compiler, there is a one-to-one correspondence between human-readable instructions and the machine-language code. ATM Asynchronous Transfer Mode. A standard for cell relay that uses fixed length cells of 53 bytes, 5 bytes of which are headers. Can support multiple services including voice, video and data. Authorization Permission to access non-public information or use equipment that is either fully or partially restricted. Process of establishing what you can do. Autonomous system A collection of one or more networks that are administered by the same entity. Each regional network (such as SURAnet) is an autonomous system. Backbone Refers to a piece of cable used to connect different floors or departments together into a network. Backspace A keyboard operation that moves the cursor one place to the left. Backup A resource that is or can be used as a substitute when a primary resource fails or when a file has been corrupted. Baseband A network medium that uses only one carrier frequency. Examples are Ethernet and PhoneNet. Binary number A number written using binary notation which only uses zeros and ones. Example: decimal number seven in binary notation is: 111. Bit A binary digit, either a 0 or 1. In the U. S. , 8 bits make up one byte; in Europe, byte equals one word. Bits per second (bps) The speed at which bits are transmitted. Block A sequence of words or characters written contiguously, such as into a group, by a computer and stored on a disk, diskette, magnetic tape, etc. Booting Turning on your computer. Break An interruption to a transmission; usually a provision to allow a controlled terminal to interrupt the controlling computer. Bridge A device that connects two networks and passes traffic between them based only on the node address, so that traffic between nodes on one network does not appear on the other network. Broadband A communications medium on which multiple signals are simultaneously transmitted at different frequencies. Broadcast A single message addressed to all nodes on a network. Browser A software tool used to read electronic documents. Mosaic, NetScape and Lynx are the most popular browsers. Buffer A temporary memory for data, normally used to accommodate the difference in the rate at which two devices can handle data during a transfer. Bug An error. Can be a hardware malfunction or a software programming error. Bulletin board (BBS) A computer system which can be called using a modem. BUS topology Network wiring commonly used by Ethernet in which all nodes on the network see all packets. Byte A group of adjacent binary digits, usually 8, on which a computer operates as a unit; often used to represent a single character. Cable A set of wires connecting pieces of computer hardware. CD-ROM Compact Disk – Read Only Memory. Character Any symbol (usually alphabetic, numeric, or punctuation) that can be entered into your computer. Character set A set of characters handled by a specified machine; sets include alphabetic characters, numbers, symbols, graphics characters, a space character and control characters. Chip A tiny piece of semi-conductive material, usually based on silicon, used in the manufacture of electronic components. Client A computer program that uses the services of another computer program. Software that extracts information from a server; your auto-dial phone is a client, and the phone company is its server. Client/server A relationship in which client software obtains services from a server on behalf of a person. COBOL Common Business Oriented Language The first standardized computer language. Code A language for expressing operations to be performed by a computer. Command A request, type from a terminal or embedded in a file, to perform an operation or to execute a particular program. Communications line A physical medium (wire, microwave beam) used to transmit data. Communications program A program that makes a computer act as a terminal to another computer. Communications programs usually provide for file transfer between microcomputers and mainframes. Compiler A program that translates human-readable programs into a form the computer understands. Concentrator A device that brings together at a common center connections to a particular kind of network (such as Ethernet), and implements that network internally. Configuration The particular hardware elements and their interaction in a computer system for a particular period of operation. Control key A special function key on a computer keyboard, frequently used in combination with alphabetic keys, to enter commands. Copy A function that reads data from a source, leaving the source data unchanged and writes it elsewhere. CPU Central Processing Unit. The main internal component of a computer where executions of instructions are carried out and calculations are performed. Crash A computer system is said to crash when it stops working for some reason and must be restarted. Cursor A symbol on a display screen that indicates the position at which the next character entered will be displayed. Cyberspace The nebulous “place” where humans interact over computer networks (the Internet is considered Cyberspace). Coined by William Gibson in Neuromancer. Data Link Layer It controls the transfer of information between nodes over the Physical Layer. Data Information suitable for communication, interpretation or processing by a computer. Data processing The systematic performance of operations on data, for example, handling, merging, sorting and computing. Dataset A file or group of files associated with one part of a study. Debug To detect, trace and eliminate errors in computer programs. Default A software function or operation which occurs automatically unless the user specifies something else. DHCP Dynamic Host Configuration Protocol. Supports booting workstations and other devices that need information from outside before they can complete the booting process, such as an IP number or name of program file to download. Dial-up To connect to a computer by calling it on the telephone. Digital Used in computers to describe information that can be represented by a collection of bits. Direct access The ability to read or write data directly from or to any location on a storage device without having to refer to data that was previously written. Directory A logical container of files and other directories; synonymous with folder. Disk or diskette A small, flat, either rigid or floppy magnetic disk for storing data permanently. Distributed Processing resides in more than one computer in a network. Distributed application Application designed so that components run on different – but cooperating – systems on a network. Distributed database The data resides in more than one physical database in a network. Distributed file system Allows files on remote nodes of a network to appear locally connected. Document A medium and the data recorded on it for human use; for example, a report sheet or book. Documentation A collection of organized documents or the information recorded in documents. A Microsoft program that controls a computers transfer of data to and from a hard or floppy disk. Drive A generic term used to identify the equipment that serves as a player or recorder for a storage medium. Dump A printed representation of the contents of a computer storage device, usually main memory, backed-up when a system crash or other failure has occurred. As a verb, refers to a large amount of data. Edit To enter, modify or delete data. Editor A program that permits the review and editing of the contents of a file. Email Electronic mail. Information exchanged by electronic means in a manner analogous to that provided by the postal service. Email address The way you specify where an E-Mail message should be delivered. Email server A computer system that provides MTA, mailbox storage and directory services and optionally UA services. E-mail service UA, MTA, mailbox storage, and directory service. Encapsulation Combining or defining a data structure of attributes and a group of associated functions and behaviors as a single object. Erase To remove data from a data medium, leaving the medium available for recording new data. Error message A message that reports the detection of an error. Error checking Uploading or downloading transfer check employed to identify errors in data transmission. Execute To interpret a computer instruction and carry out the operations specified in the instruction. Fiber optics A high speed channel for transmitting data. File A collection of any form of data that is stored beyond the time of execution of a single job. File format The type of file, such as picture or text; represented as a suffix at the end of the filename (text = TXT or .txt, etc.). File server A computer designated to store software, courseware, administrative tools, and other data on a local- or wide-area network. Folder A place where a user’s e-mail messages may be stored. Every user has a folder for new messages, and on most systems may create other folders for specific purposes. Foreground High-priority processing, usually for realtime activities, automatically given precedence, by means of interrupts, over lower-priority processing. Form The paper on which output data is printed. Form feed The feature that automatically advances a roll of paper to the top of the next page or the next form when the printer has finished printing a document or form of one or more pages. Format The defined structure of information that is recorded on magnetic media, displayed on a visual display device or printed on a page. FORTRAN FOrmula TRANslation. A high level scientific programming language. Fragment Partial packet caused by a collision. Frame A packet sent over a serial link. Freeware Software that is distributed for free, with no license fee. Frequency A measurement of the number of electromagnetic waves that pass over a given point in a given period of time. FTP File Transfer Protocol. A program that allows for file transfers over the Internet. Function key A keyboard key that gives an instruction to a computer, as opposed to keys that produce letters, numbers, marks of punctuation, etc. Garbage Unwanted or meaningless information in memory, on disk or on a tape. Gateway An electronic door between one computer network and another. GIF Graphic Interchange Format. Compuserves non-platform specific format for low-resolution, compressed graphics interchange. Gopher A client program available via the Internet that allows users to review and retrieve information on other host systems via easy-to-use menus. Graphic A computer-generated picture produced on a computer screen or paper, ranging from simple line or bar graphs to colorful and detailed images. Groupware Software that serves the group and makes the group as a whole more productive and efficient in group tasks. Example: Group Scheduling. GUI Graphical User Interface. Defines a format for scroll bars, buttons, menus, etc., and how they respond to the user. Handshaking A procedure performed by modems, terminals, and computers to verify that communication has been correctly established. Hard copy A printed copy of machine output in a visually readable form. Hard disk A data-recording system using solid disks of magnetic material turning at high speeds. Hardware Physical computer equipment such as electrical, electronic, magnetic and mechanical devices. Header The portion of a message, preceding the actual data, containing source and destination address and error-checking fields. Hierarchical file A hierarchical file is one that contains information collected on multiple units of analysis where each unit of analysis is subordinate to another unit. Host A computer that is made available for use by multiple people simultaneously. Host computer In the context of networks, a computer that directly provides service to a user. HTML Hypertext Markup Language. A convention of codes used to access documents over the World-Wide Web. HTTP HyperText Transfer Protocol. Extremely fast protocol used for network file transfers in the WWW environment. Hub A device that is a center of network activity because it connects multiple networks together. Hyperlink A pointer that when chosen displays the item to which it points. Hypermedia Media (such as text, graphics, video, audio) that contains hyperlinks. Hypertext A document which has been marked up to allow a user to select words or pictures within the document, click on them, and connect to further information. Icons On-screen pictures that symbolize various commands. I/O Input/Output. The part of a computer system or the activity that is primarily dedicated to the passing of information into or out of a central processing unit. IEEE Institute of Electronic and Electrical Engineers. A leading standards-setting group in the United States. Inbox The mailbox that holds incoming e-mail. Index A list of the messages contained in a conference or a mail folder. Information hiding A technique by which the structure and precise usage of information and data is concealed. Information server A computer on the Internet which acts as a library of documents and files that users can download. Information superhighway A term popularized by Vice President Al Gore. According to his vision, it is a high-speed network of computers that will serve thousands of users simultaneously, transmitting E-mail, multimedia files, voice, and video. Inheritance The ability of hierarchically-arranged objects to acquire attributes and behaviors of objects above them without duplicating the code. Input As a verb, to enter information, instructions, text, etc. , in a computer system or program. Instance A particular occurrence of an object defined by a class. Instantiation The act of creating an instance of a class. Instruction A statement to the computer that specifies an operation to be performed and the values and locations of the data to be processed. Interactive Pertaining to an application in which each entry evokes a response from a system or program, as in an inquiry system, for example, an airline reservation system. INTERNET A concatenation of many individual TCP/IP campus, state, regional, and national networks (such as CSUNET, SUPERNET, WESTNET, NSFNET, ARPANET) into one single logical network all sharing a common addressing scheme. IP Address The numeric address of a computer connected to the Internet; also called Internet address. Interrupt A suspension of a process, such as the execution of a computer program, caused by an event external to the computer and performed in such a way that the process can be resumed. IRC Internet Relay Chat, or just Chat. International standard making body responsible for the OSI network standards and the OSI reference model. Job A set of data that defines a unit of work for a computer; it usually includes all necessary computer programs, linkages, files and instructions to the operating system. JPEG Joint Photographic Experts Group. The ISO proposed standard for compression of digital data, especially 24-bit color images. Justify In word processing, to print a document with even (straight, non-ragged) right and left margins. Kermit A communications protocol that allows you to transfer files between your computer and on-line network systems. Key An identifier in a database or file. A primary key is a unique identifier. Keyboard Similar to a typewriter, contains the letters for typing text, and keys that give the computer its commands. Kilobyte (K) 1,024 bytes, often used to mean 1,000 bytes. A network that usually covers a contiguous and fairly small geographical area. LAN e-mail system An e-mail system in which the UA runs on LAN-attached workstations. Laserdisc Large, metallic-looking records about the size of 33 RPM albums (12 inches in diameter), sometimes called videodiscs. Laser printer A electrophotographic (xerographic) printer in which a laser is used as the light source. Layer A grouping of related tasks involving the transfer of information. Also, a level of the OSI reference model. Line In communications, a wire connecting a terminal to a computer; also a unit of text. Line editor An editor where the text is considered to be a series of lines separated by end-of-line markers and in which alterations are made to individual lines or groups of lines through editor commands. Line printer A computer output device in which an entire line of print is composed and determined within the printer prior to printing. Link A form of markup which designates that data within a document will automatically connect with either nested data or an outside source. LISTSERV A server that manages named lists of recipients and files and access-controls for them. Load To transfer a program held on some external storage medium (such as magnetic tape or disk) into the main memory of the machine in a form suitable for execution. Login or Logon The opening sequence of keystrokes used via computer screen instructions to connect to a system or began operations on a computer. Login ID Same as account name or user ID. Longitudinal Study In survey research, a study in which the same group of individuals is interviewed at intervals over a period of time. LPR Line Printer Remote. A protocol that allows one system to send a file to another system to be queued to a device to which the receiving system has access. Lynx A text-based World-Wide Web browser. Because it does not employ a graphics capability, it allows slower computers (or computers using a modem) to access the Internet with ease. Machine language A programming language or instruction code that is immediately interpretable by the hardware of the machine concerned. Macro A single computer instruction that stands for a given sequence of instructions. Magnetic disk A flat circular plate with a magnetizable surface layer used for storage of data. Magnetic tape A tape with a magnetizable surface layer on which data can be stored by magnetic recording. MAIL A RiceMail UA that can send mail and operate on incoming messages. Mailbox A file of e-mail messages on which a UA can operate as if they were incoming messages (read, reply, forward, delete, etc). Compare with inbox. MAILER A BITNET MTA for VM/CMS that natively supports domain names and routing through gateways. Main memory Usually the fastest storage device of a computer and the one from which instructions are executed. Mainframe The cabinet that houses the central processing unit and main memory of a computer system, separate from peripheral devices such as card readers, printers, disk drives, etc. 1,048,576 bytes, often used to mean one million bytes (1,000,000) bytes. Medium The material used to support the transmission of data. This can be copper wire, coaxial cable, optical fiber, or electromagnetic wave as in microwave. Memory A device or medium that serves for temporary storage of programs and data during program execution. Menu A displayed list of options from which a choice can be made. Message E-Mail: The unit of information transferred by an e-mail system. Method A procedure whose code implements the behavior invoked by sending a message. Methodology A methodology is a collection of methods and tools, designed and arranged so as to provide guidance in achieving a specific objective. Microcomputer A computer system in which the central processing unit is built as a single tiny semiconductor chip or as a small number of chips. Microprocessor Main computer chip that provides speed and capabilities of the computer. Also called CPU. Microwave Bandwidth ranging above one gigahertz, used for high-speed data transmission. Mission Purpose; what you are in business to do. Modem It is a device that can convert a digital bit stream into an analog signal (modulation) and can convert incoming analog signals back into digital signals (demodulation). Modem setup Modem speed or baud rate, parity, data bits, stop bits, and duplex must be set the same at the user’s computer as at the network system. Module A logically self-contained and discrete part of a larger computer program. Monitor A television-like screen that shows text, graphics, and other functions performed by the computer. Multimedia A single work assembled using elements from more than one medium, such as high-resolution color images, sounds, video, and text that contains characters in multiple fonts and styles. Multimedia mail Provides the capability to compose, send and read messages that include things such as spreadsheets, line drawings, animated graphics, high-resolution color images, digitized speech, video, and WYSIWYG text that may contain characters in multiple fonts and styles, etc. Multiplexer A device that merges information from multiple input channels to a single output channel. Multiuser The capability of some computer systems to provide access to many simultaneous users. Nesting Placing documents within other documents. NetScape One of the most recent developments in browsing technology, it is considered to be faster than the original Mosaic. Network Layer The third layer of the OSI reference model. It controls underlying telecommunications functions such as routing, relaying, and data link connections. Network A collection of two or more computers interconnected by telephone lines, coaxial cables, satellite links, radio, and/or some other communication technique. Nickname A name that can be used in place of an e-mail address. Same as alias. Node A member of a network or a point where one or more functional units interconnect transmission lines. Noise Undesirable signals bearing no desired information and frequently capable of introducing errors into the communication process. Object An entity consisting of attributes (such as color and size) stored as data and behaviors or functions (such as draw and move) that manipulate the attribute data. Object-based Supports the concept of the object and the use of messages to communicate between the objects. Object code Output from a compiler or assembler that is itself executable machine code or is suitable for processing to produce executable machine code. Object-oriented Supports the concepts of objects, encapsulation, message passing, dynamic binding and inheritance. Off-line Not connected to a network. On-line Active and prepared for operation. Also suggests access to a computer network. Online Service Commercial online services like America Online, CompuServe, and Prodigy enable their users to send and receive Internet E-Mail, although they don’t yet offer access to most other Internet services. Open platform A national Internetnetwork that would allow citizens the ability to access, create, and publish information. OSI Open Systems Interconnect. OSI reference model for network communications between computers. OpenWindows A windowing environment from Sun Microsystems based on X-windows and News. Operating system software that controls the basic, low-level hardware operations, and file management. Output Information retrieved from a computer, displayed by a computer or produced by a program running on a computer. Packet Basic component of communication over a network. A group of bits of fixed maximum size and well-defined format that is switched and transmitted as a complete whole through a network. Parameter A variable, or quantity that can assume any of a given set of values, of which there are two kinds: formal and actual. Parity Data has even or odd parity if the number of 1 bits is even or odd. A parity bit is a bit added to data to make the parity always even or odd. Password A string of characters that a program, computer operator, or user must supply to meet security requirements before gaining access. PC Personal Computer. An IBM or IBM clone personal computer (Microcomputer) that is used by one person, as opposed to a Macintosh. Physical Layer The first layer of the OSI reference model. It governs hardware connections and byte-stream encoding for transmission. Ping Packet Internet Groper. Probably originally contrived to match the submariners term for a sonar pulse. Pixel Picture Element. In computer graphics, the smallest element of a display space that can be independently assigned color or intensity. Platform Hardware environment that supports the running of a computer system. Plotter An output device for translating information from a computer into pictorial or graphical form on paper or a similar medium. Polymorphism A technique for generalizing a single behavior across many kinds of objects. Port That portion of a computer through which a peripheral device may communicate. Portable In computer usage, a file or program is “portable” if it can be used by a variety of software on a variety of hardware platforms. Post The act of placing a message in an on-line conference. The noun “posting” is sometimes used to refer to a conference message. PostScript A language defined by Adobe Systems, Inc. for describing how to create an image on a page. Presentation layer The sixth layer of the OSI reference model. It lets an application interpret the data being transferred. Printer An output device that converts the coded information from the processor into a readable form on paper. Printout The printed output of a computer. Procedure A portion of a high-level language program that performs a specific task. Process A systematic sequence of operations to produce a specified result; a unique, finite course of events defined by its purpose or by its effect and achieved under given conditions. Program A set of actions or instructions that a machine is capable of interpreting and executing. Used as a verb, to design, write and test such instructions. Programmer A person who designs, write and tests computer programs. Programming A notation for the precise description of computer programs or algorithms. Programming language languages are artificial languages in which the syntax and semantics are strictly defined. Prompt A character or message provided by an operating system or program to indicate that it is ready to accept input. Protocol An agreement that governs the procedures used to exchange information between cooperating entities and usually includes how much information is to be sent, how often it is sent, how to recover from transmission errors and who is to receive the information. Public domain Not protected by copyright; you may freely make copies and distribute them; you may make derivative works. Quality It is meeting your own specifications and meeting your customers expectations. It is also concerned with doing the right things and doing things right. Query A request that specifies the manner in which data is to be extracted from one or more databases. Queue A sequence of stored computer data or programs awaiting processing that are processed in the order first-in first-out (FIFO). Quit Ends the work without writing out a new file or new version of the exiting work file unless there is a save that interrupts before dumping the session. RAID Redundant Array of Inexpensive Disks. A way of creating a fault-tolerant storage system. RAM Random Access Memory. Memory in which each element can be individually addressed and accessed with the same speed as any other element of the memory. Random access Differs from direct access by the fact that each element can be accessed with the same ease and speed as any other. Re-engineering The circular process of going from code to models then back to code that might be in a different language, use a different DBMS or be more structured. Read To sense and retrieve or interpret data from a form of storage or input medium. Read/write A magnetic mechanism that can read, write and erase data encoded as polarized patterns on magnetic disk or tape. Realtime The processing of transactions as they occur rather than batching them. Pertaining to an application in which response to input is fast enough to affect subsequent inputs and guide the process and in which records are updated immediately. Record A collection of related data or words, treated as a unit. For example, in stock control, each invoice could constitute one record. Record length Depending on the context, the length in bytes (i.e., columns) of a physical record or a logical record. Recovery The process by which databases are rebuilt after a system fails. Rectangular file A physical file structure. A rectangular file is one which contains the same number of card-images or the same physical record length for each respondent or unit of analysis. Reel tape One-half inch magnetic tape stored on round reels. Also called Round Tape. Relational database An organization of data into tables with each column containing the values of a data element and each row representing a record. Relational structure A study that includes different units of analysis, particularly when those units are not arranged in a strict hierarchy as they are in a hierarchical file, has a relational structure. Remote Equipment or site that is located out of the way or at a distance from primary equipment or a larger or primary site. Sometimes used as the opposite of local. Remote access The ability to access a computer from outside a building in which it is housed. Resource An on-line information set or an on-line interactive option. Response A message placed in a conference as a follow-up to a topic or to another response; or, a reply to an e-mail message. Retiming A function of a repeater or Ethernet hub that receives a signal, cleans and regenerates it, and then sends it. Return key The key on a terminal keyboard that, when struck, places the cursor at the left margin one line below its previous horizontal position. Reuse and Reusability An approach to software engineering that emphasizes reusing software assets, including designs and code, and building software assets likely to be reuseable in future applications. Reverse engineering The process of going from the more concrete level of code to the more abstract level of models for data and processes. ROM Read-only memory. Information is stored once, usually by the manufacturer, that cannot be changed. Most compact discs are ROM. Root directory The directory that contains all other directories. Router A device connecting separate networks that forwards a packet from one network to another based only on the network address for the protocol being used. For example, an IP router looks only at the IP network number. Routine Part of a computer program, or a sequence of instructions called by a program, that may have some general or frequent use. Routing The process of finding a path over which a packet can travel to reach its destination. Run The single, continuous execution of a program by a computer on a given set of data. As a verb, to initiate processing by a program. Scanner A device that senses alterations of light and dark. Scheduling An automated capability to schedule meetings and/or resources (such as meeting rooms, projectors, etc.) by looking at online calendars. Screen The surface of a monitor on which information can be viewed. Screen editor A program that allows a file to be edited by making changes to the text displayed on the screen. Scroll To move all or part of the display image vertically or horizontally to view data otherwise excluded. Segment A section of network wiring. Segments are connected by repeaters, bridges and routers. Sequential A method of storing and retrieving information that requires data to be written and read sequentially. Server A computer that shares its resources, such as printers and files, with other computers on the network. Service (or service provider) An organization that provides access to part of the Internet. You have to arrange for an account with a service to connect your computer to the Internet. Session Networking term used to refer to the logical stream of data flowing between two programs and being communicated over a network. Session Layer The fifth layer of the OSI reference model, it provides the means for two session service users to organize and synchronize their dialogs and manage data exchange. Shell A term that usually refers to the user interface of an operating system. A shell is the command processor that is the actual interface between the kernel and the user. Simulation An imitation of the behavior of some existing or intended system, or some aspect of that behavior. Soft copy An electronic version of a file, usually in computer memory and/or on disk; as opposed to hard copy, the paper printout. Software Computer programs that perform various tasks. Word processing programs (like WordPerfect or Microsoft Word), spreadsheet programs (like Lotus or Excel), or database programs (like dBase III+, Foxbase, or FileMaker) are all software. Software tool A program that is employed in the development, repair or enhancement of other programs. Sort To arrange a set of items in sequence according to keys; for example, to arrange the records of a personnel file into alphabetical order by using the employee names as sort keys. Source code The program in a language prepared by the programmer. This code cannot be directly executed by the computer and must first be translated into object code. Sponge A job that runs in the background on the IBM 3090 mainframe computer in such a way that it uses only those CPU cycles not needed by other work, yet is so computationally intense that it soaks up all unused CPU cycles. Spreadsheet Software program that allows mathematical calculations, such as budgeting, keeping track of investments, or tracking grades. SQL Structured Query Language. ANSI standard data manipulation language used in most relational data base systems. Storage A device or medium that can retain data for subsequent retrieval. Strategy long-term plan, tactic, or scheme for attaining a vision. Striping Disk striping copies blocks, bytes or bits across multiple disks in such a way that if one disk is lost, the data can be created using the blocks or bits on the remaining disks. Sun Microsystems Sun originally stood for Stanford University Network, a name given to a printed circuit board developed in 1981 that was designed to run UNIX. SunOS The name of the operating system of the workstation from Sun Microsystems. It is based on Berkeley UNIX and AT&Ts System V UNIX. Surfing Netspeak for wondering, whether one is surfing through cable stations or surfing the Internet. Tape density A measure of how much data, can fit on a magnetic tape. Task A separately dispatchable function on a computer. TCP/IP Transmission Control Protocol/INTERNET Protocol. The communication protocols on which the Internet is based. Telecommunication Communicating with other people through the computer using communication software and modems. Telecomputing Using computers for telecommunication; computer networking. TELNET A program that allows users on the Internet to log in to remote systems from their own host system. Terminal A device connected to a computer network that acts as a point for entry or retrieval of information. Terminal emulation Most communications software packages will permit a personal computer or workstation to communicate with another computer or network as if it were a specific type of hardware terminal. Terminal server A device that allows asynchronous devices such as terminals to select and then communicate with hosts or other devices over a network. Terabyte 1,099,551,627,776 bytes, often used to mean one trillion bytes (1,000,000,000,000). Text A string of characters. A text file should contain only characters – as opposed to codes and commands. Time out What happens when two computers are talking and one fails to respond within a certain time, for whatever reason. Time series Observations of a variable made over time. Many economic studies such as International Financial Statistics, and Citibase are time series datafiles. TN3270 A version of TELNET providing IBM full-screen support. Toggle Using one command or keystroke to change between one mode and its opposite. Token ring A LAN and protocol in which nodes are connected together in a ring and communication is controlled by a special packet called a token that is passed from node to node around the ring. Topic In a conference, a message which is generally written to convey a new idea or a new piece of information, relevant to that conference. Transfer To copy or move information from one computer to another. Transport Layer The fourth layer of the OSI reference model. It provides transparent, reliable and cost-effective transfer of data. Tree A way of organizing information with general categories at the top, subcategories below, and narrower subcategories on a further level. UNIX A popular computer software operating system used on many Internet host systems. Upload To transfer information from a users system to a remote system. Opposite of download. URL Uniform Resource Locator. A scheme used to locate a document accessible over the Internet. Usenet The network of UNIX users, generally perceived as informal and made up of loosely coupled nodes that exchange mail and messages. User Anyone who uses a computer connected to the Internet. User-friendly A system or program that relatively untrained users can interact with easily. Userid A code that uniquely identifies a user and then provides access privileges to a computer system. Username Account name or user ID. Utility A specialized program that performs a frequently required everyday task such as sorting, report program generation, or file updating. Variable In social science research, for each unit of analysis , each item of data (e.g., age of person, income of family, consumer price index) is called a variable. Vision A future-oriented statement of where you want to be, of what you want things to be like. Virtual Pertaining to a device or facility that does not physically exist, yet behaves as if it does. Virtual terminal A program that makes a general purpose computer behave like a terminal. VMS Virtual Memory System. An operating system for the VAX and Alpha computers of Digital Equipment Corporation. Volume A physical unit of a storage medium, such as tape reel or disk pack, that is capable of having data recorded on it and subsequently read. Wavelength The length of one complete electromagnetic wave, measured usually from crest to crest or trough to trough of successive vibrations. Whois The name of the nickname database that contains full name, postal address, telephone number, and network mailbox for registered users. Window A rectangular area on a display screen in which part of an image or file is displayed. The window can be any size up to that of the screen and more than one window can be displayed at once. Windows A trademark of Microsoft Corporation for a software product that provides an environment for a graphical user interface for DOS and DOS applications. Word processor A program used to enter or edit text information in personal computers, often used to create a file before it is uploaded to a network; may also be used to process text after it has been downloaded. Wordwrap An editor feature that causes a word that will not fit on a line to be moved in its entirety to the next line rather than be split at the right margin. Work space Disk space made available to the system to provide temporary storage space for files too large to fit within a users permanent disk storage quota or for files not needed beyond a single run of a program or set of programs. Workstation A general purpose computer that is small enough and inexpensive enough to reside at a persons work area for his or her exclusive use. Wwrite To record data in a storage device, a data medium, or an output display. WWW World Wide Web. A wide-area hypermedia information retrieval technology that interconnects information around the world. X window system A standard for controlling the display on a bitmapped terminal. X-windows normally uses a network connection, and unlike the typical terminal connection, multiple applications possibly on different computers can use the display simultaneously in different windows. X-term An X-windows client that provides a window for terminal emulation.